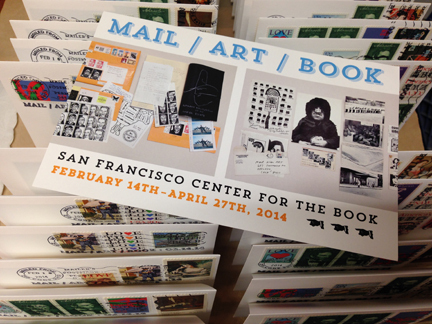 The exhibition catalog for “mail/art/book” is a soft cover, full color record of all the artwork on display at the SF Center for the Book. Designed by Maureen Forys of Happenstance Type-O-Rama and photographed by Von Span Photography, this catalog is a welcome addition to bookshelves and reference collections. Included in the catalog are two essays: “A History of West Coast Mail Art: Artwork from the Patricia Tavenner Archive” by John Held Jr. and “Our Path is Strewn With Words and Letters: Making, Mailing, and Postal Modernism” by Jennie Hinchcliff. Copies of the exhibition catalog can be purchased in person at the San Francisco Center for the Book. If you would like to order via email, please direct all queries to malgosia@sfcb.org, with the subject header “mail/art/book catalog”. You can also call SFCB during business hours (415.565.0545) and ask to speak with Malgosia directly. Catalog price is $40.00 per copy, plus $8.00 shipping and handling (domestic). Catalogs can also be shipped internationally, with shipping prices varying depending on destination. 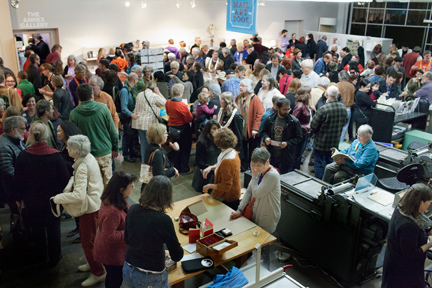 All catalog sales directly benefit the San Francisco Center for the Book, a 501(c) non-profit organization which fosters the joy of books and bookmaking, as well as the continuing presence of books in our culture. This entry was posted in mail/art/book exhibit and tagged ex postal facto, jennie hinchcliff, john held, jr, mail/art/book, san francisco center for the book, sfcb. Bookmark the permalink. ← Ex Postal Facto 2014: what a weekend! Jennie, just ordered my copy. Can’t wait to hold it in my hands!! Was so sorry to miss the weekend and thrilled that there is a catalog. Thanks!!! !